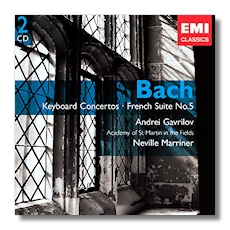 Gavrilov's recordings of seven Bach keyboard concertos date from April 1986. At the time, the pianist was 31. This was not long after his arrival in the West as a resident. (Apparently, Gavrilov was the first Soviet musician who was allowed to remain in the West without seeking political asylum.) Although I don't always enjoy Gavrilov's later recordings, his Bach on EMI has a lot to offer. Of course Bach did not write these works for a modern concert grand. In Bach's time, they were played on a harpsichord, but many pianists argue that Bach would have used a piano if one had been available to him. The piano has a wider dynamic range, and an (arguably) wider range of expression than the harpsichord. Some pianists take full advantage of this when they play Bach. Others scale back, as if to remind the listener about the music's origins. Gavrilov is closer to the latter group than the former. His coolly precise, détaché playing has more to do with the harpsichord than the piano. (It also has something to do with the Russian school of pianism, but that's beside the point.) Sometimes, this approach is taken to an extreme. Take, for example, the Keyboard Concerto in F, which is the composer's adaptation of the Brandenburg Concerto #4. Gavrilov is so hush-hush, even cutesy, in this concerto that it comes close to affectation. Of course Marriner had something to do with this as well. Still, the overall impression made by these recordings is a positive one. Gavrilov's tone is always bright, and his playing is like a tonic, or mineral water. The engineering properly balances the piano and the orchestra, and captures all due detail. David Oistrakh came from an earlier generation than Gavrilov – two generations, actually, because Oistrakh was born in 1908, and Gavrilov was born in 1955. Like Gavrilov, Oistrakh faced opposition from Soviet authorities when he wished to establish an international career. It wasn't until after World War Two that Oistrakh was allowed to travel abroad extensively, and audiences in the United States had to wait until 1955 to hear him in person. His death in 1974 predated the Soviet Union's thaw (and meltdown). Still, as the country's most famous and respected violinist, he was allowed to perform and record elsewhere (as long as he returned), if only to show the rest of the world what great talent was produced by the Soviet Union. 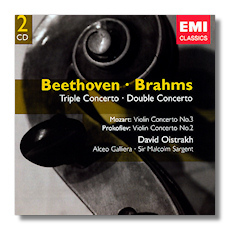 The London-based recordings collected here date from 1956 (the Brahms) and 1958 (everything else). They have been regarded as classics of the gramophone almost since their first release, and they still stand up to the closest scrutiny. Oistrakh was not an edgy violinist in the manner of Heifetz, although his technique was no less secure. With his warm tone and Olympian phrasing, Oistrakh could be counted upon to make the listener feel good, no matter what the repertoire was. He was both a classicist and a humanist. Listening to the Mozart concerto, for example, one is struck by how round all of the notes are, and how Oistrakh's violin often sounds like a viola. (In fact, he also played that instrument to perfection.) The Oistrakh sound never seems monotonous or precious, nor does his musical personality feel unapproachable. A word or two about his colleagues is in order. Galliera is superb in the Brahms and in the Prokofieff, although one could argue that he is too volatile in the Double Concerto. This is not particularly Germanic Brahms! Still, he makes a nice foil for Oistrakh, and also for Fournier, who is hardly less patrician than the violinist. The Mozart also shows what a fine conductor Oistrakh was. (Later in his career, he conducted more and more often, and even though he couldn't duplicate his fantastic tone with an orchestra, he certainly could imbue one with his serene personality.) The Beethoven Triple Concerto is not played as forbiddingly as it sometimes is. Sargent is very relaxed here, and Oborin is a fine pianist. On the other hand, Knushevitzky is on a slightly lower level than Oistrakh and Oborin. At times, his playing sounds thin. Oistrakh's later version with Richter and Rostropovich, and conducted by Karajan, remains a favorite, but it is more tense than the present reading. These are digital remasterings from 1996. The recordings, even though they are half a century old, still sound gorgeous, and I don't think anyone will feel disappointed on this account either. This is must-buy, if you don't have the individual recordings already! Both releases are in EMI's "Gemini" series, so they are inexpensive too.